Product prices and availability are accurate as of 2019-04-19 06:51:48 EDT and are subject to change. Any price and availability information displayed on http://www.amazon.com/ at the time of purchase will apply to the purchase of this product. 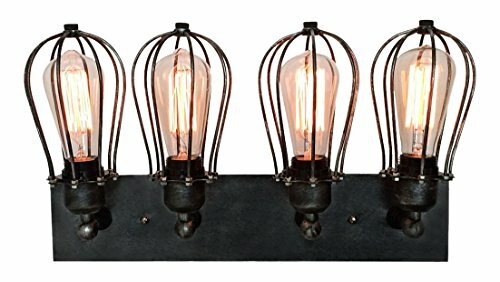 WestMenLights 4 light vanity lighting: height: 280MM (11.02 inches); width: 500MM (19.68 inches); color: black; item weight: 5KG; voltage?110V - 240V; material: metal, wrought iron, glass; lamp holder: E27 base (VDE certified); style: antique, industrial, vintage; maximum compatible wattage: 60 watts; included components: shade included; specific uses: indoor use only; power source: corded-electric. Bulbs not included in the fixture; type of bulb: incandescent, Edison (vintage-industrial) bulbs. Each lighting fixture comes with everything needed for installation.